Mineski claimed the first place at PGL Open Bucharest with an amazing performance: 2 victories in the group stage and a 4-1 score in the playoffs. Eight teams clashed at PGL Open Bucharest: Evil Geniuses and LGD Gaming received a direct invite, while the remaining six had to pass the regional qualifiers. Mineski participated as a representative of the SEA region, where they gained a ticket for the PGL Minor with a 6-1 run. The teams were split into two groups, and battled in a best-of-three format - Mineski fought in the group B. They defeated Natus Vincere and Evil Geniuses, earning a spot in the playoffs. In the best-of-three single-elimination playoffs, Mineski had the upper hand versus Immortals in the Semifinals, and encountered LGD Gaming in the Grand Final. Also the final matchup followed the Bo3 format, and the SEA team asserted their dominance with a quick 2-0 victory. *LGD received 67.5 points instead of 90 because their coach Yao "QQQ" Yi played as stand-in during the event; he replaced Chen "Victoria" Guanhong who was affected by health issues. Mineski maintained the advantage during the entire first match, and finally ended it at 34 minutes with a 10k net worth lead. Anucha "Jabz" Jirawong was a fearsome opponent for LGD as he kept interfering in every lane with his roaming Earth Spirit. Daryl Koh "iceiceice" Pei Xiang on Monkey King obtained the first blood against Enchantress after two minutes. 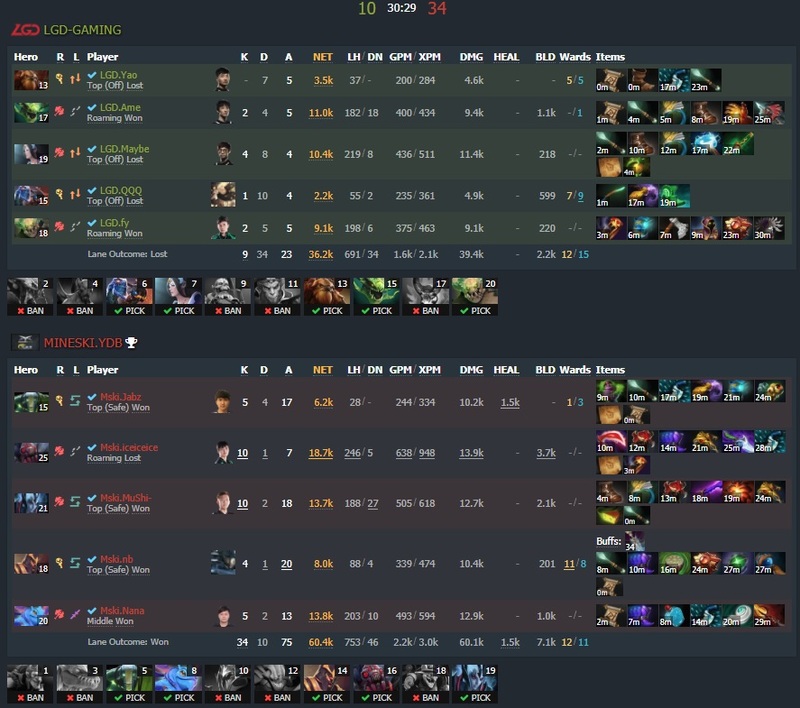 Even if only a handful of deaths took place in the early game, both teams kept pushing, and destroyed two towers each. At 21, Wang "Ame" Chunyu got the Aegis with Ursa, but Minesky quickly punished him with two deaths. A small teamfight followed which brought money and more towers in their hands - finally the gold difference started increasing. LGD won a big fight at 26 minutes, but it wasn’t enough to change the fate of the game. Both iceiceice and Chai "Mushi" Yee were farmed and ready to dance. In the successive 10 minutes they pushed the mid lane and engaged in a series of battles that led to LGD defeat. After losing the mid barracks the Chinese team decided to call GG. 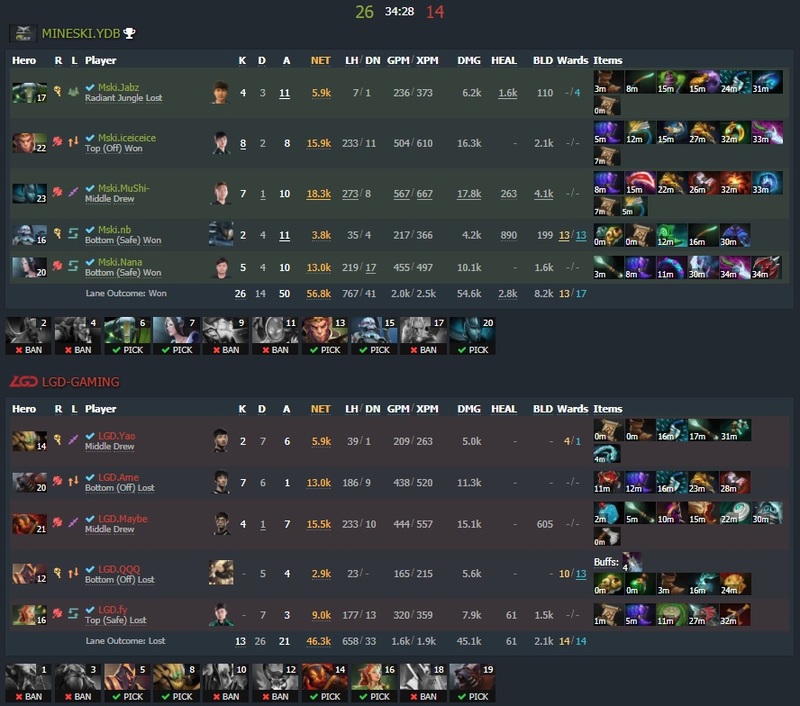 Mineski literally overwhelmed LGD in game two, ending it at 30 minutes with a 34:10 score. The SEA team utilized an early game lineup composed of pushers and gankers. Silencer, Earth Spirit, and Vengeful Spirit dominated the safe lane, killing multiple times Mirana and Jakiro. LGD had a good amount of AoE to counter Broodmother, but due to the aggressivity of the enemy there was no time to prepare an adequate defense. Iceiceice’s BM destroyed three towers himself in the first 20 minutes. LGD lost multiple teamfights from minutes 15 to 20, and Mineski kept increasing their gold lead. Once again iceiceice and Mushi were carrying the team: the latter achieved a 10-2-18 score by the end of the match. Mineski won two decisive teamfights at 26 and 27 minutes that provided enough space to keep pushing down the enemy tier 2 towers. LGD’s barracks were still up when they realized that all hopes were lost: they surrendered after losing a final battle at 30. The group A of StarLadder i-league Invitational S3 Minor continued with a battle between Team Liquid and Mineski. Liquid triumphed 2 to 0. Mineski advanced to the Grand Finals of SL i-league Invitational S3 Minor after defeating compLexity gaming 2 to 1.